As the weather continues to chill me to the bone (50F is cold here in California! ), I keep getting the urge to bake. I love the gentle hum of the oven, the warmth it brings to my kitchen, and the delicious food that emerges when the cooking is done. However, being the holiday season and all, I’ve already had enough sweets and I haven’t even done my holiday baking yet! So instead, I’ll rely on my oven to cook dinner tonight. 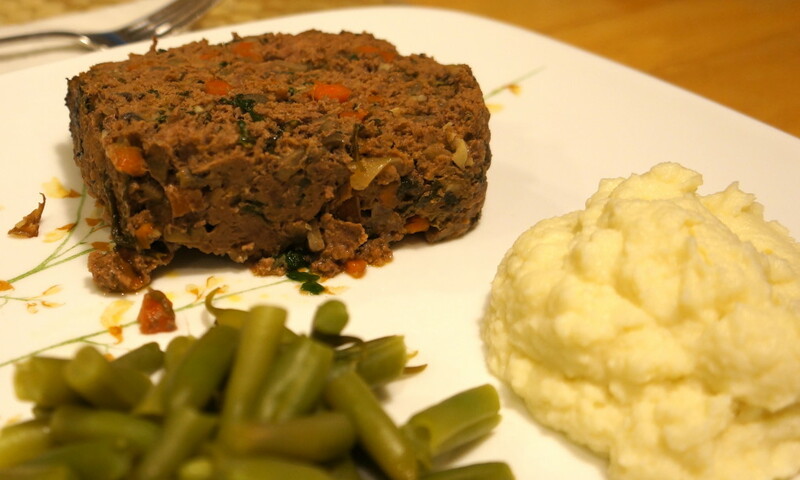 Meatloaf is an inexpensive, humble, comforting meal, made of ground meat and whatever flavorings you like. And it’s so good! Growing up, Mom made it with Lipton onion soup or sometimes a can of cream of mushroom. 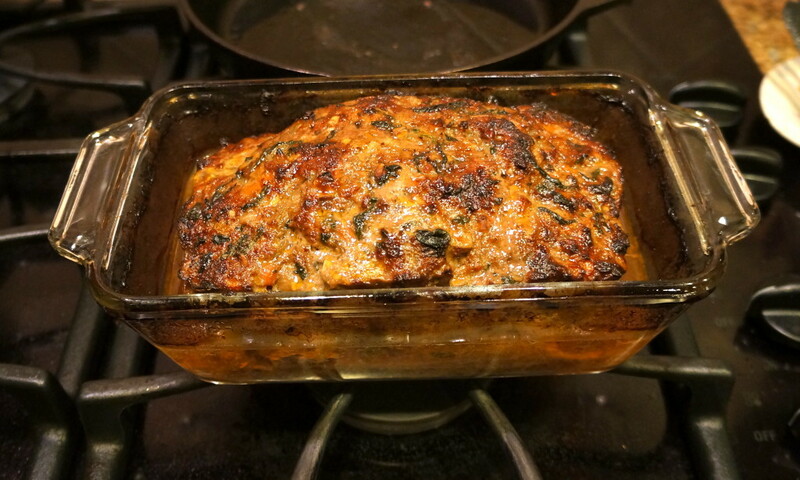 As I’ve learned to cook and enjoy real, unprocessed food, I’ve created a great meatloaf that reminds me of comfort food of my childhood, but nourishes my family and our bodies as well as our hearts. I’m all about adding as much nutrition as I can to the food I make (while balancing that with good flavor). I think this meatloaf fits the bill! The standard meatloaf side dishes in my childhood home were canned corn and mashed potatoes (usually of the potato bud variety). I would mix them all together and enjoy the goodness of all that creamy, starchy protein. I still often make mashed potatoes (and I still like to mix my food together), but sometimes I switch it up and mash some cauliflower (which, incidentally, my kids prefer). I also like to have a green vegetable at most meals, so tonight I’m making green beans. One other exciting addition to tonight’s meal is my newly rendered tallow, which I made myself from 5 lbs. of raw grassfed beef suet. It was a long process, but so worth it since it made my meatloaf especially tasty. Melt the cooking fat in a large skillet over medium heat. When it is hot, add the onions and cook for about 5 minutes or until slightly softened. Add the mushrooms and carrots. Season with sea salt and pepper and cook for about 10 minutes until tender. Add the garlic and cook for about a minute. Then add the spinach and cook until wilted, about 2 minutes. 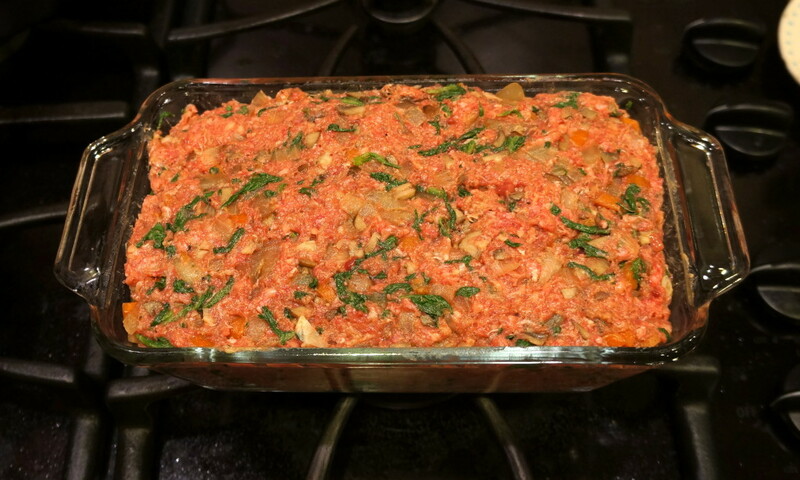 While the vegetables are cooking, mix the ground meat with the chopped liver and ketchup in a large bowl. You will want to use your hands for this one! When the vegetables are finished cooking, let them cool until you can touch them safely. Taste for seasoning and adjust as needed (you want it to be a bit salty so it will flavor the meat well enough). 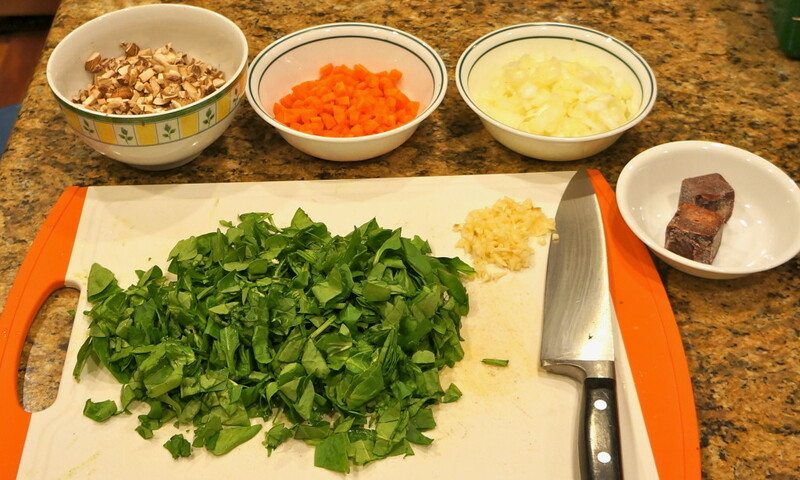 Add the veggies to the meat mixture and mix well. Press the meat into a loaf pan, making sure it is evenly distributed. Bake at 350F for about an hour, draining some of the liquid about halfway through the cooking time. The meatloaf is done when it reaches an internal temperature of 155F. Let rest for 10 minutes, slice, and enjoy! This post is linked to Tasty Traditions, Fight Back Friday, Monday Mania, and Real Food Wednesday. Looks good Rebekah. I haven’t tried the greens in mine, but I may have to give it a try. I don’t know if the kids will rebel though. I’ve been reading about mashed cauliflower a lot lately. I did make stuffed cabbage with cauliflowere rice which was a success. I guess mashed is next. Thanks, Amy! My kids don’t even notice the greens–spinach wilts really small. You could also puree the greens and then mix them in. And cauliflower is so versatile! I love it riced, mashed, curried, you name it! 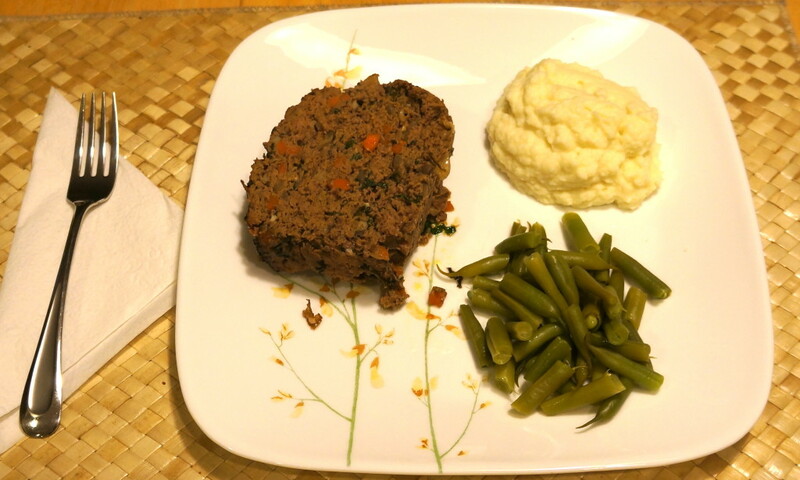 Beautiful looking meatloaf and I hope you do not mind but I referenced it on my cooking article on mirepoix/sofrito use in such recipes. Its a great example and looks awesome I am sure to try it! I made bone broth and skimmed the fat after the broth was refrigerated and froze the fat to use later. I have a question for you: what is the fat that is skimmed from homemade broth? Is this tallow? 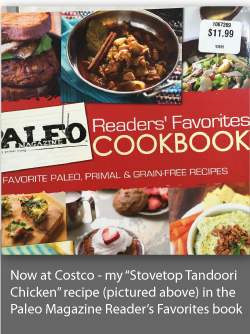 Yes, the fat you skim off of beef bone broth is tallow, but it has been cooked for a long time, so I wouldn’t keep it to cook with. Some people do (and say it is delicious), but if you cook your broth for 12-24 hours, I think the fat is probably damaged by then and no longer a good idea to consume. Can this be done without the sauteeing part? I’d love to throw all the ingredients in raw with the meat and have it bake together (to save time, dishes, sanity). Is this possible? Have you tried it? Thanks! I’m glad to find a meatloaf recipe without breadcrumbs! 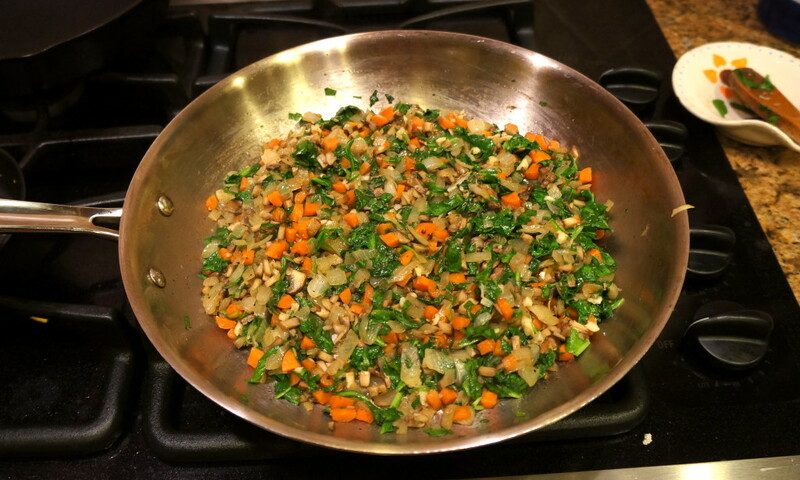 You could probably use all raw ingredients, but I find that sautéing the vegetables first results in a more flavorful meatloaf. I don’t care for the taste of raw onions and garlic, so precooking them mellows the flavors. It also removes some of the liquid from the vegetables so that the meatloaf isn’t overly watery. You can certainly try it with all raw ingredients and see how it turns out. Let me know if you do!